Want to tone your legs and glutes, develop your arms, sculpt six-pack abs and strengthen your core? Try the Bosu Toss & Catch. 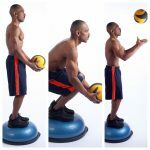 Stand on the domed side of a Bosu ball with feet with in shoulders width and abs contracted. Lower your body until your knees are at a 90-degree angle. As you raise your body to the starting position, toss the ball in the air and catch it. That is one rep.
Do 3 sets: Set 1- 6 reps. Set 2-5 reps. Set 3- 4 reps.